Please note this programme is currently on hiatus. The Filmmaking Academy is a free seven-day workshop where young filmmakers get the opportunity to write, shoot and edit their own films! - You'll learn how stories work and have the chance to write your own script. - You'll receive hands-on training on a professional camera and sound equipment. - You'll be part of the crew shooting a film on a set in the LFS studio. - You'll learn to edit the films using professional software. - All classes are taught by professional filmmakers. - And the week will end with your film screened in the LFS cinema! No previous filmmaking experience is necessary. All we ask is that you're enthusiastic about making films! Over 50 participants attended the first ever Filmmaking Academy in the summer of 2016. All ten films made during the four editions of the Academy were shown at a special celebratory screening at the end of the summer, allowing friends and family to see the films up on the big screen. 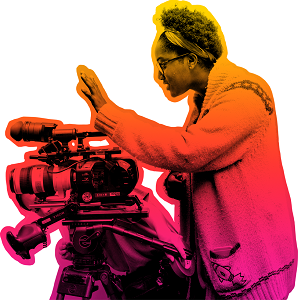 In the October half-term participants were invited to attend a Next Steps workshops at the BFI where they developed more advanced camera and screenwriting skills, and were introduced to industry professionals who offered advice about how to forge a career as a filmmaker. If you have any further questions or wish to be added to our mailing list please email outreach@lfs.org.uk. The Filmmaking Academy is supported by Into Film who help teachers and educators to achieve a wide range of effective learning outcomes in their use of film. The wider Into Film programme includes a network of extra-curricular film clubs, resources for use in clubs and in the classroom, training opportunities, a cinema-based film festival and annual Awards. Their extensive offer has been designed to meet the needs of all four nations in the UK, find out more at www.intofilm.org.